Here is an intesting video to assist with your fibonnacci trading. It relates specifically to Forex trading. 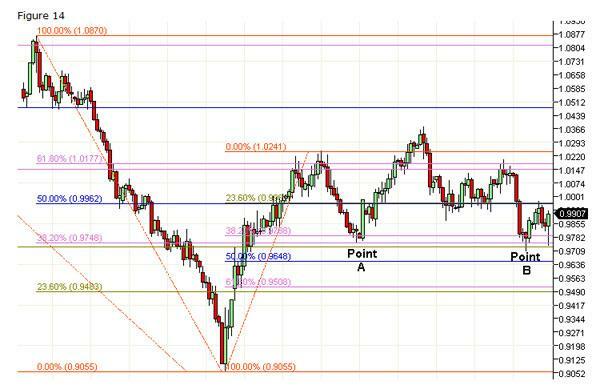 The fibonacci tool is an especially helpfull trading indicator to assist with you with technical analysis. Discover â€œNext Generation Tradingâ€ systems to improve your trading results Learn more here. Leonardo Pisano, was Italian mathematician born in Pisa during the The middle Ages. He was renowned as one of the most talented mathematicians of his day. . The name Fibonacci itself was a nickname given to Leonardo. It was derived from his grandfatherâ€™s name and means son of Bonaccio. While most attribute the Fibonacci Sequence to Leonardo, he was not responsible for discovering the sequence. In 1202 Leonardo published a book called, Liber Abaci. In it he derived a method for calculating the growth of the rabbit population. Suppose a newly-born pair of rabbits, one male, one female, are put in a field. Rabbits are able to mate at the age of one month so that at the end of its second month a female can produce another pair of rabbits. Suppose that our rabbits never die and that the female always produces one new pair (one male, one female) every month from the second month on. The puzzle that Fibonacci posed was…. This mathematical progression is now recognized as the Fibonacci Sequence. Starting with zero and adding one, each new number in the sequence is the sum of the previous two numbers. In our example, 0+1 = 1, 1+1=2, 1+2=3, 2+3=5, and so on. The sequence of numbers looks like this: 0, 1, 1, 2, 3, 5, 8, 13, 21, 34, 55, 89, 144, 233, to infinity. From this sequence you can easily reason that at the end of one year there would be 233 pairs of rabbits. This sequence has repeatedly appeared in popular culture from architecture to music to television. While the series is a powerful tool, the analysis of one number with the number up to four places to the right. The first three are shown below. While some are not exact, if you repeat this mathematical analysis through multiple sets of data, you will see we arrive at some well known and fairly consistent ratios. The dimensional properties adhering to the 1.618 ratio occur throughout nature and the ratio is most referred to as The Golden Ratio. The uncurling of a fern and the patterns found on various mollusk shells are commonly cited examples of this ratio. This number, when added to 0.618, equals 1. These ratios have been used for over a hundred years in the financial markets by the likes of W.D. Gann and Ralph Nelson Elliot. Up until the late 90s the tracking and use of these numbers were a manual process. With the proliferation of real-time charting and data, software that automatically calculated and displayed these levels brought Fibonacci into the financial mainstream. While there have been countless books and articles written on the use of Fibonacci in technical analysis, the basics are simple. Fibonacci Trading is an art form anyone can master with a little practice. On the price scale, these ratios, and several others related to the Fibonacci sequence, often indicate levels at which strong resistance and support will be found. Many times, markets tend to reverse right at levels that coincide with the Fibonacci ratios. On the time scale Fibonacci ratios are one method of identifying potential market turning points. When Fibonacci levels of price and time coincide you have high probability entry points. Discover â€œNext Generation Tradingâ€ systems to improve your trading results – Learn more here. I just have to let you know about an excellent article. It talks of the Leo Trader Pro. The never before seen technology used to programme this unique expert advisor makes it a must have. And…theres a bonus giveaway too! To find out more, while there is still time, head straight over to the article here. For another great and 100% free offer you can check this out! Fibonacci ratios are one of the most commonly used techniques in technical analysis of the financial markets. If you are already a successful trader or a trader just starting out, Fibonacci Retracements provide valuable insight and triggers on where high probability change will happen. The Fibonacci Retracement is likely the most common of all Fibonacci related tools. While there are many variations of the ratio set, I think simple is better. 38.2%— This is the first line of defense of the current trend. Breaking this level starts to erode the underlying trend. Within this set, 38.2%, 50% and 61.8% I find quite reliable. I use the others as more confirmation and as part of clusters. The Fibonacci Extension is less common but just as powerful when correctly applied. Used as part of a money management strategy and as profit target projection tool, Fibonacci Extensions provide guidance on where price will potentially stall or change direction. Used in combination, these two ratio sets provide very tradable indicators of opportunity. If you then combine Fibonacci with other indicators like oscillators and moving averages, you can quickly identify high potential risk/reward opportunities. While not perfect, they are one of the best tools available. In our previous examples we have seen how both Fibonacci Retracements and Fibonacci Extensions can be powerful tools on their own. Often, I use multiple Fibonacci Retracements to determine entry and exit points. And then also combine Fibonacci Extensions. Letâ€™s look at an example where using multiple Fibonacci Retracements prove very useful. 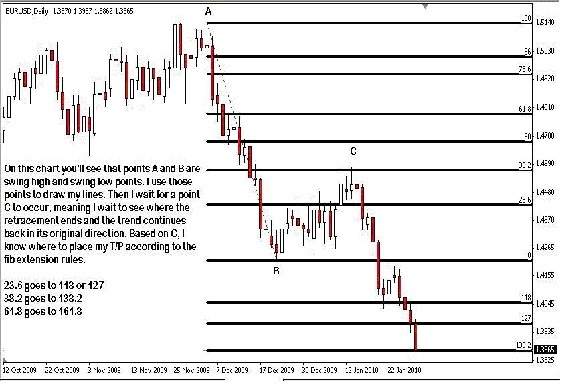 In Figure 13 we see the dramatic fall of the USDCAD that we looked at from a different perspective in Figures 4, 5 & 6. In the figure above I have added two Fibonacci Retracements. Take special note to the two areas highlighted. These areas identify clusters of Fibonacci levels. The bounce off the bottom blew directly though the first cluster of 23.6% and 38.2%. In subsequent retracements, this level became support and you could have safely used it as a very low risk entry point. Additionally, the 38.2% and 61.8% cluster became resistance. In two of three cases you could have used this information for low risk short side entry points. Now letâ€™s add one more Fibonacci Retracement. In the figure above I have added a third Fibonacci Retracement. For the patient trader, the third set Fibonacci Retracement levels provides more confidence that both Point A and Point B are high quality and low risk entry points from the long side. After practicing this method for a while, you will find it common for you charts to have multiple Fibonacci Retracements. 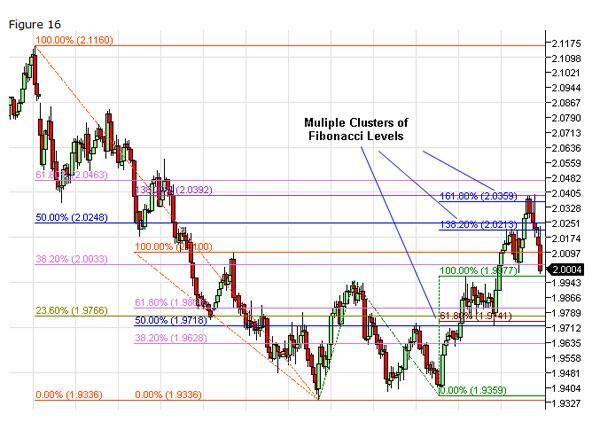 Learning to create and read Fibonacci Retracement clusters is a powerful and valuable tool for your Fibonacci Toolset. You can also cluster multiple Fibonacci Extensions. In Figure 15 you see this in action. 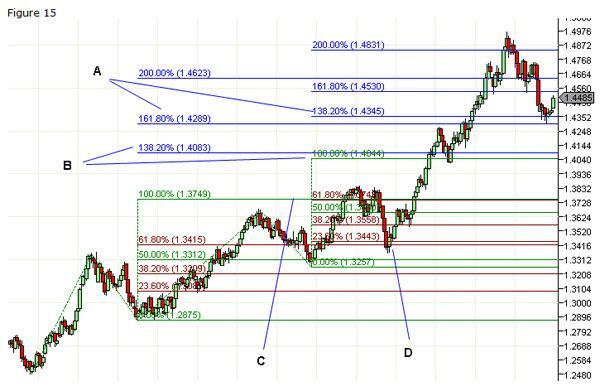 In this chart you see two different sets of Fibonacci Extensions applied. As you can see there are four, two level groups. Each of these groups represents low risk entry points. Ideally, you would want to initiate the position somewhere between the two levels. Additionally, with this type of setup, you can almost trade from pair to pair. As you can see by the previous two examples, it would be very easy to draw countless retracements and extensions on virtually any chart. It really depends on the chart and the price action. 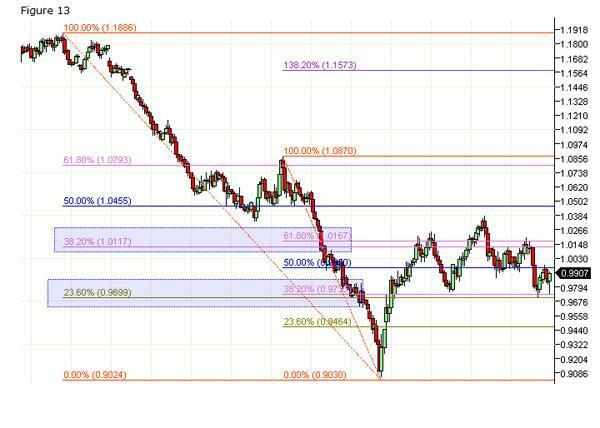 In Figure 7 we looked at the Bottoming of the GBPUSD using one basic Fibonacci Retracement. Letâ€™s revisit GBPUSD on a bigger scale and add to our thesis. In our next chart I have added a larger Fibonacci Retracement that encapsulates the entire top to bottom move and I have added a Fibonacci extension from the high and low swing points within the retracement price action. These additions are shown on our chart below. Take special notice of the Fibonacci clusters highlighted. Each of these clusters served as either support or resistance points. And each created a tradable opportunity.